Do you like Pokemon? Have you ever wondered what it would be like to roleplay in the world with Pokemon living as your friends and companions? Are sandbox roleplays your forte? We might just have the place for you! 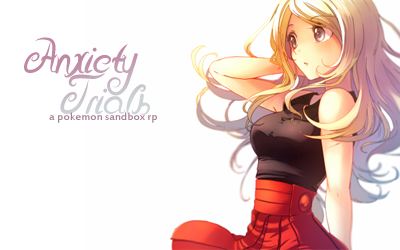 Anxiety Trials is a Pokemon roleplay site based loosely ob the Pokemon Special/Adventures manga. This means we have a more realistic, more everyday life feel to our plots. You can be as involved or as uninvolved as you choose in the site plot, and you can post when you feel inspired. With no word count or post requirement to stay as a member, all you need to do is check in now and then to let use know you're still interested. The Knights of Arceus have control over Arceus and the Forces of Nature trio. By promising to cease any attacks on civilians and any more storms should they be granted their desire to rule the regions under one unified government, the Pokemon Leagues of each region have begun making the decision to agree. Though Kalos and Sinnoh still resist, the only chance the world has of remaining the way it was is for the Pokedex Holders and other brave trainers to stand up and fight. The civilians however are not entirely displeased with the agreement, glad to be resettled into their homes and to have their cities rebuilt. It is up to the final coming days to decide what direction the world will travel.